Special pricing! Free ground shipping! 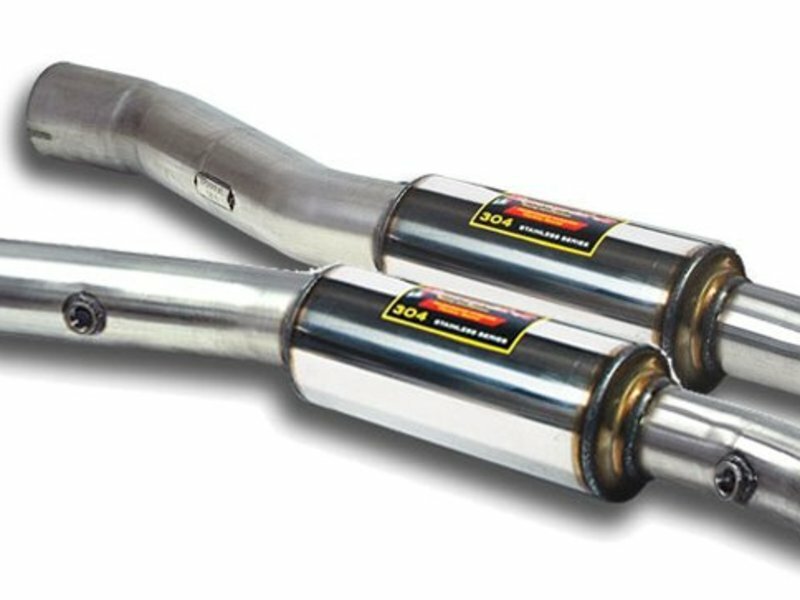 As part of their complete 750 exhaust system, Supersprint offers these cat-delete tuned resonators. These fit to the Supersprint headers at the front and to a Supersprint section 2 at the back end. These resonators fit in place of a set of catalytic converters for the least amount of restriction but still with a great refined sound. Using these without a catalytic converter is for competition use only. Fitment Note: This section 1 was designed to be used only with the a Supersprint headers, down pipes, and a Supersprint section 2. These resonators include post-cat O2 sensor ports allowing for a complete installation by extending your original post-cat O2 sensors to the new location. Special Race software or module may still be required to keep the SES light and fault codes from appearing. This is an exhaust section designed for performance improvements on the racetrack or other off-road situations. This part alters or deletes the emissions equipment on your car, and may not meet emissions standards in all states. Because of this, we require a waiver of emissions compliance to be signed and sent in to TMS. You can download the waiver here.